Webtool announces the successful completion of testing of the Webtool CRT200 Cable Retrieval Tool by The Nippon Salvage Co. Ltd in Japan ahead of deployment for a cable gripper repair campaign. The CRT200 was load tested to 20 tonnes with a 125mm (4.9”) submarine power supply cable. Developed in consultation with international certification body and classification society, DNV GL, the CRT200 Cable Retrieval Tool is the only cable and umbilical retrieval tool to meet the exacting design codes and standards for marine operations, and offshore and platform lifting appliances. Specifically, the CRT200 satisfies the requirements of DNVGL-ST-N001 Marine Operations & Marine Warranty, June 2016 and DNVGL-ST-0378 Standard for Offshore & Platform Lifting Appliances, May 2016. 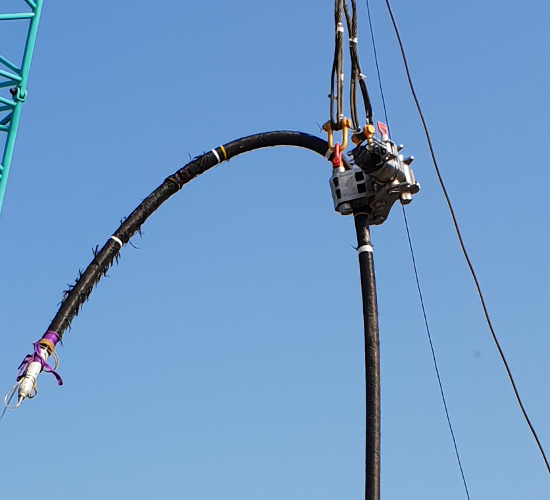 Designed to allow the safe and controlled recovery of damaged cable and umbilical, up to 203 mm (8”) diameter, the CRT200 provides a streamlined cable recovery where the gripper, guided by an ROV, is lowered onto the end of the cable without requiring preliminary clearing of the soil around the cable. The mechanically locked gripping action ensures the umbilical cannot escape during retrieval; moreover, an internal clutch mechanism prevents damage from over-tightening. By gripping the end of the cable, it makes subsequent handling much easier, enabling the cable to be recovered to a reeler or spooler on the surface vessel. The CRT200 cable gripper weighs approx. 600 kg and can be used at any water depth and is available with hydraulic hot stab or torque bucket interface options. “The testing of the CRT200 went very well and demonstrated the tool’s powerful capability in cable recovery. We look forward to deploying it offshore Japan later this year,” said The Nippon Salvage Co. Ltd spokesperson. For more information on the Webtool CRT200, visit the Cable Recovery page, call +44 (0)1254 615100, or email: info@allspeeds.co.uk. You can also get in touch by connecting with us on our Facebook page.